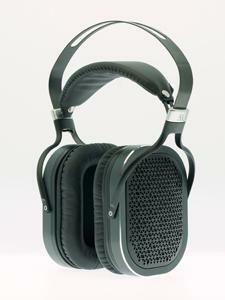 Acoustic Research has introduced a new over-the-ear headphone that uses planar driver technology. The AR-H1 uses 86mm planar drivers with a neodymium magnet array and has a stated frequency response of 10 to 70 kHz. Sensitivity is rated at 100 dB/V, and impedance is 33 ohms. The package includes a 1.2m audio cable, a 6.3mm plug adapter, and a soft carrying pouch. The AR-H1 is scheduled to ship at the end of this month and will carry an MSRP of $599. Acoustic Research announced it will soon ship a new hi-resolution, over-ear headphone with planar driver technology for unmatched sonic performance. The new AR-H1, which was previewed at several recent audio enthusiast events including High End 2017 in Munich, Germany, and CES Asia in Shanghai, China, is scheduled to ship at the end of this month at a suggested retail price of $599/649€. The AR-H1 represents a new standard in headphone performance for the price point by incorporating planar technology--acclaimed for achieving detailed output with drastically reduced distortion compared to other technologies--with an open-back circumaural or over-ear design for exceptional comfort and sound quality. "Acoustic Research has a long history of developing high-performance consumer audio products that are considered the best in class, in terms of both performance and aesthetics, said Sebastien Manenc, Senior Vice President, Asia, Voxx International Corporation, parent company of Acoustic Research. "The AR-H1 lives up to the best of AR's legacy, especially in the way it outperforms competitive models costing hundreds more, let alone headphones at the same price." Featuring an industrial design that is both comfortable and aesthetically appealing, the AR-H1 gives music lovers an unbeatable listening experience, thanks to the 86mm planar driver with a neodymium magnet array that is considered among the best in its class. Frequency response is measured at 10 to 70 kHz, with sensitivity rated at 100dB/V and impedance at 33 ohms. A true hi-resolution headphone should be as comfortable as it is sonically exciting, which is why the AR-H1 features as a genuine leather headband and low resilience ear cushion that add up to hours of listening with no fatigue. The AR-H1 comes complete with essential accessories, including a 1.2m audio cable (3.5mm 3-pole to dual 2.5mm 2-pole), a 6.3mm plug adapter, and a soft pouch for easy storage and portability. It will be available through the Acoustic Research website and select dealers. • For further information, visit www.acousticresearch-hifi.com. • Chasing the Holy Grail of Audio at HomeTheaterReview.com.